I thought I would never say this about a book, but if you’re just going to read one book this year, make this the book. The Oracle Within by Jennifer Posada is a multidimensional meditation; it is a reading; the words are encoded; unusual energy is transmitted when you read. It is an experiential event which cannot be seen on the paper; you are not alone when you read the book. The language is deceptive, subtle—then suddenly you find yourself slipping behind a veil. You are pulled into a winding labyrinth, following a path into a very different world: A guided tour of a world of deep vision, its textures, its beings, its unusual joys, its happiness with life, through the eyes of a young woman who brings back the memories of being in love with the corridors of eternal Light. Rare insight into the mind of a young being who never forgot. In wordless wonder, through the simple words you feel again the surprise of life that you found in you when you were young. I rarely get to read books all the way through. I read this book twice. Probably will again. Because when I read it, I find myself remembering, feeling deeply and comfortably connected with vaster parts of me. But in the end, it is the compelling certainty of Jennifer the Oracle – a certainty that this path of wisdom is available to each and every being – that assures some forgotten part of you that the Oracle Within is most incredibly alive. 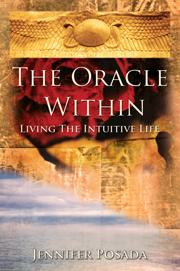 I just read The Oracle Within by Jennifer Posada and I would highly recommend it as both a source of inspiration and a guide for living the intuitive life. The book is a unique combination of Ms. Posada’s true-life story of being born an awakened Oracle, who began giving readings when she was 7-years old (now 28-years old), memories of being an Oracle in her past lives, and an authentic approach for living the intuitive life in today’s world. I found the book very moving because the description of the accounts of the author’s life and what she has learned are obviously a heart-felt expression of the love and appreciation she has for all life. And, because of the higher wisdom and purity of thought in which The Oracle Within was written, I frequently had the thought as I was reading it of how wonderful it would be if it was a part of the reading curriculum of every school and higher educational system across the country. It would definitely raise the consciousness of the world. If you are looking for something more meaningful then the usual “self-help” books currently available, this is it. Here is your chance to learn at the feet of an actual living oracle. Feel the power of her words as they reawaken a memory that has been slumbering in the depths of your being. Understand your connection to ancient wisdom, to your deepest longings … to the divinity of who you are. “The Oracle Within” is like having a huge box of chocolates all to yourself. The writing is so magical that it can leave you breathless if you simply hurry through it!! Jennifer Posada is a truly gifted and radiant Soul. We are, indeed, fortunate that she is stepping ahead of us along life’s path, illuminating the way. wisdom, this book offers us the tools to access it. memory of who we truly are. to current and newly emerging energy systems. healing power of sound to individuals and groups.